I’m really sorry for disappearing for the past few weeks. School started the Tuesday after Labor Day, and since then things have gotten truly insane. There is so much hype about junior year. It seems like when my classmates used to talk about The Bachelor and the scary new P.E. teacher, they now talk about AP classes and college apps. All of this hype freaked me out a little bit. My label-maker went into overdrive, I felt as though my life was scheduled down to the minute, I was constantly writing myself illegible notes on my phone, I had calenders solely dedicated to keeping track of my other calenders. I did a dryer load of fuzzy socks, so I could put them on when they’re still warm. I painted my nails this electric peachy pink color. I went on a long walk blasting “Don’t Drop That Thun Thun” and looking at the trees. Then I started noticing things again and how beautiful everything was. I noticed how the light reflects of the wavy windows in my neighborhood, how birds manage to nestle into precarious little crevices of brick walls without falling down, and how simply tilting my chin can give me a whole new perspective on my neighborhood. I wondered what the world would look like if I were 6 feet tall, or what it looks like to Carly. Before I knew it, I was eighteen blocks away from home. Most of the time, I bake for a purpose (bake sales, birthdays, sports games), and I absolutely love my classic cookie/blondie/brownie repertoire (i.e. things that can be eaten with one hand on the way to English class or on the sidelines). But I think that sometimes, it’s important to make something impractical and crumbly. Like this crostata. It’s not particularly ridiculous like some of the other things I make. It doesn’t have the “wow” factor of a triple-decker Nutella cake or oreo-stuffed chocolate chip cookies. It’s a little crumbly, a little rustic, and the dough looks a little like a six-year-old’s play-dough creation. But it’s really delicious. It’s one of my favorite things to make. It’s pretty simple and great for sharing. Perhaps some would say that it’s a little “pointless.” But maybe “pointless” isn’t such a bad thing after all. Preheat oven to 400 F and grease a 9″ tart pan. into the flour. Work the butter into the dough until it forms clumps. zest, baking powder and a pinch of salt. Keep working the dough until is it very crumbly and slightly sticky. couple of times, then take off about 1/3 of the dough (for the lattice pattern on top). over the jam, pressing lightly at the edges so they stick to the crust. Bake for 25-30 minutes or until the top is lightly golden. I got this recipe from one of my lovely readers, The Cooking Actress. She refers to this pie as “the most delicious thing you’ll ever eat,” and after tasting it, I can see why! The theme for baking club this past week was “pies,” in the spirit of Thanksgiving and autumn. 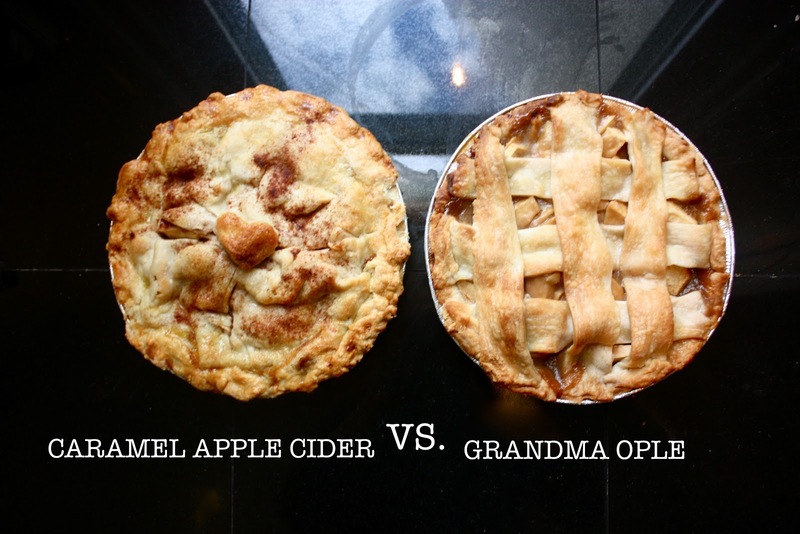 I made two apple pies, two home-churned ice creams, and there were many other pies available as well. But guess which pie disappeared first in a crowd of hungry high-schoolers? This chocolate chip cookie pie. I mean, who wouldn’t want a warm, gooey, chocolate chip cookie the size of their head? This is nothing like those stale, chocolate chip “cookie cakes” that you find at the supermarket. This is super chewy, buttery, and dense… imagine the best chocolate chip cookie in the world on steroids. Oh, and did I mention this pie is about 10 times easier to make than regular chocolate chip cookies? This recipe is the newest edition to my permanent repertoire, and will be making an appearance at my Thanksgiving table, Pi Day at school, and every other occasion that requires pie. Pour in to pie shell. Bake for 50-60 minutes. Lately, the farmer’s market has been overflowing with ripe peaches. My mom and I picked up around a dozen on Sunday. My dad was returning from Newport, and picked up another full bag on his way home. Since we had so many peaches rolling around the kitchen counter, I decided to make one of the many peachy recipes that I had saved. I cannot tell you how glad I am that I did. All of the elements and textures of this tart come together so harmoniously. Fruity sweetness from fresh peaches. Crunchy flavor from the streusel. The streusel topping really gives this tart an extra layer of nutty, buttery, crunchy goodness. The custard filling bathes the peaches in a voluptous, sweet, creamy mixture. 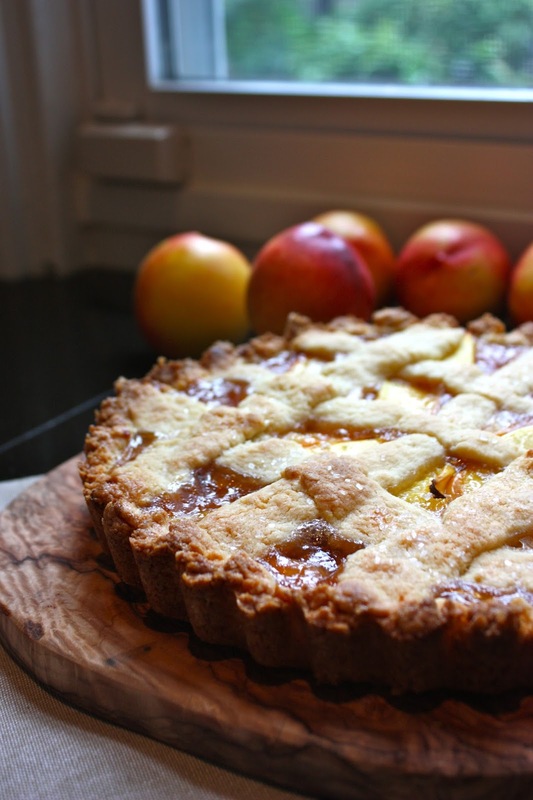 And what really makes this tart so stellar are the fresh, aromatic summer peaches. My mom especially loved this tart, proclaiming that it was the best dessert I have baked yet (even better than my morning buns!). Please, do yourself a favor and whip this up while we still have such a plethora of perfect, summer peaches. What is your favorite peachy dessert? lined with parchment or a silicone mat. aside while you make the creamy filling. another 20 minutes, at which point you should add the streusel. refrigerator and, using your fingers, break it up into small bits. the creamy parts of the tart. pan to a rack to cool until barely warm or at room temperature.